Queen Italian dolomites-Cortina d'Ampezzo-Winter Olympic resort in the vast basin surrounded on each side of a world surrounded by the one three thousand meters high mountain. The center, which was several decades ago to date, now slightly behind ambitious neighbors who invested and upgraded significantly. Traditional elegant hotel Cristallo has a panoramic location on the outskirts of the resort Cortina d' Ampezzo, about 5 minutes walk from the center. Can also take advantage of a shuttle service to downtown - available to clients free of charge. Hotel Cristallo is one of the hotel bearing The Leading Hotels of the World, the first 5 * hotel in the Dolomites less than an hour's drive from the airport in Venice. Hotel Villa Argentina suitable for athletes and families in the hillside amidst the beautiful natural scenery of Cortina d' Ampezzo. Hotel Villa Argentina is located in the famous resort of Cortina d' Ampezzo in part Pocol, about 4.5 km from the center of Cortina. The nearest shops and restaurants about 100m. Pleasant traditional hotel Menardi near the center of Cortina d'Ampezzo and slopes. Hotel Menardi is located about 1.2 km from the center of Cortina d'Ampezzo, nearby walking. Shops and restaurants about 400 meters. Hotel consists of a main and secondary buildings (dependence) - about 30m apart. Hotel Domina Home Alaska is a great location in the resort of Cortina d ' Ampezzo in the center near the pedestrian promenade. The elegant Hotel Bellevue is located in the heart of the popular, not only ski resort Cortina d' Ampezzo in the pedestrian zone. Lower Barisetti pleasant hotel is located about 400m from the center of the famous ski resort of Cortina d'Ampezzo. Victoria Parc Hotel is furnished in a traditional furniture Tyrol is located in the center of the resort Cortina d'Ampezzo, at an altitude of 1,237 m.
Hotel Aquila is conveniently located right in the center of Cortina d ' Ampezzo in the pedestrian zone, close to restaurants, shops and bars. Pleasant Panda smaller hotel with a family atmosphere is located in the popular town of Cortina d Ampezzo just a few meters from the pedestrian area with shops and restaurants. The Hotel Europa is located just 5 minutes walk from the center of the renowned resort in the middle of the Dolomites, Cortina d'Ampezzo. Furnished in traditional style. Shops, restaurants and bars just a short walk away. Recently renovated Lajadira Hotel & Spa is located in the famous ski resort of Cortina d'Ampezzo, about 1.5km from the city center (15 minutes walk). Throughout the day is provided shuttle service to the center and back. It consists of the original of the completed renovated and new parts. Cristallino Hotel is located in the resort of Cortina d'Ampezzo, on the outskirts of the city center with private garden, close to the beautiful local countryside. Pedestrian area only 5 minutes walk from the hotel, shops - Corso Italia, restaurants, bars. Paola hotel owner gladly provide good tips for spending your winter and summer holidays in Cortina. One of the oldest hotels in the city, hotel Cortina, situated in the popular resort of Cortina d'Ampezzo, also called the Queen of the Dolomites, in the center of the pedestrian promenade. Shops, restaurants, bars and all amenities center in walking distance. Traditional Hotel Ancora is located in the resort of Cortina d'Ampezzo, in the center of the pedestrian promenade. Excellent location to stay in the middle of events in the center and also close to the slopes. Ancora is one of the original hotels in Cortina, retains elements of traditional local architecture and design, with several antique pieces of furniture. Grand hotel Misurina is located in a beautiful setting on Lake Misurina at an altitude of 1750 meters, about 8 km from the famous ski resort of Cortina d' Ampezzo. Shuttle service from hotel to Cortina in designated times for free. Residence Misurina has a beautiful panoramic location right on the lake Misurina. 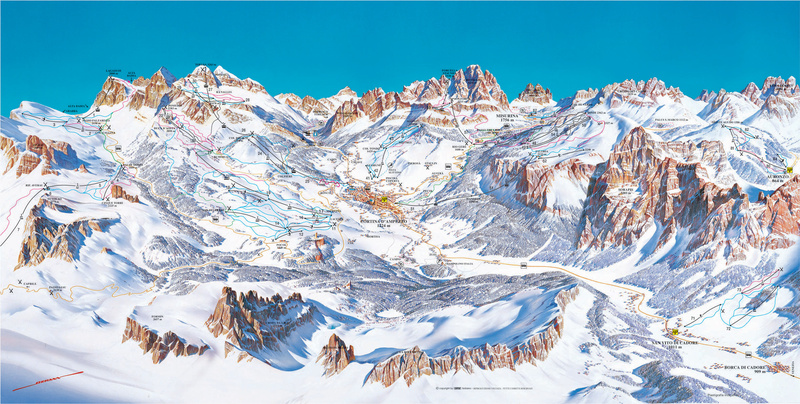 From the world famous resort of Cortina d'Ampezzo is only 8 km. Shuttle to Cortina at designated times for a fee. Who visited her, certainly understands the epithet "queen" of the Italian Dolomites. Beautiful city in the country is just as beautiful in the winter really something special - incomparable.